Diamonds and gemstones, or as we like to call them - nature's treasures, have always been statements of culture, fashion, stature, trading, business and more. They have invoked profound interest in many over the years, an interest which has sparked the desire to learn more about their internal world and secrets. 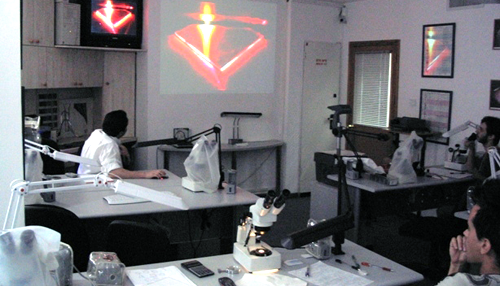 GW College, also known as the Gem Color Academy, and formerly known as EGC and GIPS, is the longest established gemological institute in Israel, since 1975. Over the years, the college has trained more than 4500 students, many of whom have joined the world gem industry and are among its prominent members. The GW College is a recognized educational institute by the 'Ministry of Economy', and works closely with the 'Ministry of Aliyah and Integration' and with the 'National Insurance Institute' to provide students with an effort-free enrollment. Gemology (or Gemmology), the science of gems, is divided into 3 general areas: 'Diamond Grading', 'Colored Diamond Grading' and 'Gem Identification'. The GW College courses cover all of the above areas and provide students with the required knowledge to be a professional gemologist and gem grader. The courses 'Colored Diamond Grading' and 'Colored Stones Grading' are considered the most comprehensive and advanced grading programs for gems in the world. The courses combine virtual lessons, accompanied by videos and printed materials, with practical exercises, using digital and non-digital grading tools on actual gem samples. The GW College courses are carried out online, led by top experienced gemologist tutors, who had qualified from the most renowned gemological institutes, and are updated continuously on the new advancements and developments in the market. GW College's practical lessons are held in various sites around the world. Each site includes a unique collection of thousands of actual colored stones and diamonds, as well as hundreds of online digital gem images, aimed at transforming the theoretical information learned by the student into actual practice. In addition, GW College cooperates with leading gem companies to enrich the practical education by attaining a variety of quality levels of gems to display to the students during the lessons. The entire education program is supervised by Menahem Sevdermish, Gemewizard's CEO and founder. © 2019 Gemewizard. All rights reserved.